There is no shortage of options to choose from when it comes to selecting a ferry from Aeolian Islands to Sicily. There are 1 ferry company with a combined offering of 21 Ferry Routes connecting Vulcano to Palermo, Lipari to Palermo, Milazzo & Messina, Salina to Palermo, Milazzo & Messina, Rinella to Palermo, Milazzo & Messina, Filicudi to Palermo & Milazzo, Alicudi to Palermo & Milazzo, Stromboli to Milazzo & Messina, Rinella to Palermo, Milazzo & Messina, Vulcano to Palermo, Milazzo & Messina, Lipari to Palermo, Milazzo & Messina & Salina to Palermo, Milazzo & Messina. The fastest route between Aeolian Islands and Sicily is Vulcano to Milazzo with a crossing duration of around 45 minutes. With so many routes on offer we make it simple by comparing all similar routes in one search so you can quickly find what you are looking for. The Aeolian Islands or Isole Eolie as they are known locally are group of islands and islets in the Tyrrhenian Sea to the north of Sicily off the coast of Italy. 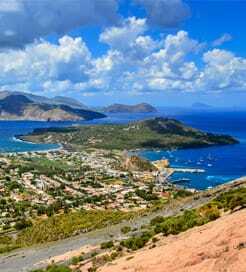 Named after Aelous, the God of the wind by Greek settlers, the Aeolian Islands comprise of Lipari, Vulcano, Salina, Stromboli, Panarea, Filicudi, Alicudi and Basiluzzo. The main island – Lipari, is located more or less towards the centre of the group and in addition to featuring numerous hotels is a hub for connections to the other islands. There are no regular air services to the islands; therefore the only way to get in and around is by ferry, with regular services offered between the islands and to/from Sicily and mainland Italy by some of the region’s most popular ferry companies. Like a lot of the Italian islands, the Aeolian group are becoming increasingly popular with tourists and during the summer season the population swells enormously. 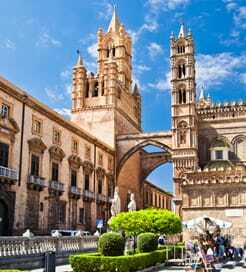 The island of Sicily, located off the south coast of Italy is the largest of the numerous Italian islands and is surrounded by the Ionian, Tyrrhenian and Mediterranean Seas. Parts of Sicily are on the same latitude as the coast of North African which results in a mild climate that makes the island an attractive year round destination, not just with domestic visitors from mainland Italy but abroad too. As with many of the Italian islands, the tourist season peaks in the summer months. On Sicily's eastern coast you’ll find Mount Etna, the greatest active volcano in Europe and undoubtedly one of the regions attractions. Perhaps in part due to its geographical location, but in the main because of its obvious attraction as a destination, Sicily features a host of regular ferry connections with neighbouring islands and the Italian mainland as well as international connections with the likes of Malta and Tunisia.